Strike a new style chord with these fun socks featuring an acoustic guitar pattern. 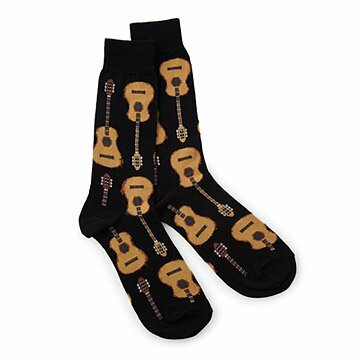 Strike a new style chord with these fun socks featuring an acoustic guitar pattern. Made from a smooth cotton blend, they're a gift sure to resonate with any music lover. Made in South Korea. Great gift for a musician! Thanks for once again offering products that make great gifts! Great stocking stuffer for grandson taking guitar lessons. Perfect for the guitar player in your life! Everyone needs socks. It's a good day knowing that the socks you're wearing will remain comfortable all day long. Having 2 guitar players in our family these were an appropriate gift ! These socks are great. Warm, and cozy. My husband says they fit perfectly, and they washed nicely. They came out of the dryer softer than when they went in. My son is a guitar player and loves fun, stylish socks. These are great! This is a Christmas gift but the quality is very good!